Slime Season 3 succeeds on multiple levels, none more exciting than his ongoing exercise in seeing just how elastic syllables are. Young Thug has released a trilogy of trilogies in his short but prolific career (I Came From Nothing, 1017 Thug, and Slime Season) and each has taken a similar arc: start off by masterfully paying homage to a vogue style, release an uneven sequel that betrays novel experimentation, and finalize the trilogy by emerging with a new sound all his own. Though less than half the length of the first two Slime Season installments, Slime Season 3 is the most realized aesthetically and suggests exciting things for the forthcoming Hy!£UN35. The bouncy post-“I Know There’s Gonna Be (Good Times)” journey was revealed at Kanye West’s The Life of Pablo release event, when Young Thug was handed the aux cord (the 2016 version of passing the torch?) to play some of his unreleased music, opting for Slime Season 3 starter “With Them". The bass is distant a la Barter 6 opener “Constantly Hating", but on “With Them", there’s shiny synths that don’t detract from the beat’s minimalism; instead, they constantly seem to be working double-time just to keep up with his frantic rapping. 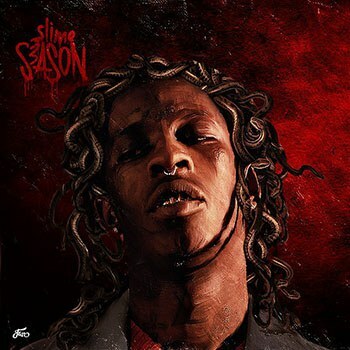 While the beats are excellent throughout, with some of his most frequent collaborators turning in some of their weirdest and engaging productions yet, nothing compares to the sheer thrill of listening to Young Thug speak, yell, double-and-triple-time, murmur, participate in a one-man call-and-response, and croon his way through the verbal absurdities that are expected and enthralling all at once. Over funky steel drums, Thug unleashes a dazzling array of internal rhymes on “Drippin’", punctuating each rhyming syllable with force yet allowing them to hang in the air to fully register. Yet, less than a minute after some of the most coherent rapping of his career, he veers into a slurred scream -- “Didn’t I tell you about playing with Lil Jeff? !” There’s nothing passive about any moment on Slime Season 3, and this intensity recalls the razor-sharp mastery of Lil Wayne’s mid-to-late-2000s peak. It matters little what he’s saying -- just notice the contradictory “I got a hell of a kidney!” on I’m Up’s “For My People” when compared to Slime Season 3’s “I think I need help with my kidney” -- how he says these things is what presents such a challenging listen. Though Slime Season 3 follows the aforementioned template of stylistic experimentation, there’s one song that backtracks and was preceded by a superior version: the ballad “Worth It", whose counterpart on Slime Season 2, “Raw", is one of the strangest and best songs Young Thug has ever made. Save for that misstep, everything else on the tape is forward-thinking and frightening in the sense that the date of his recording sessions are rarely known -- the futuristic “Pacifier” from 2015 was revealed in Thug and record executive Lyor Cohen’s Apple Music interview with Ebro that the song was made all the way back in 2012. If what he made now five years ago sounds fifth years ahead of its time, what could the other music from the long-gestating Hy!£UN35 sessions sound like? Slime Season 3, along with the aforementioned “Pacifier” and the single “Paradise” seem to hold some of the answers. With much of rap drowning themselves in Auto-Tune and seeking subdued trap beats, Young Thug’s spun the opposite way and begun enunciating clearer than ever over production brighter than any he’s had since I Came From Nothing 3. While he’s claimed (and, depending on how you feel about his music, proven) that he can write a perfect song in mere minutes, the best hooks on Slime Season 3 are those more reminiscent of the verse-like structure of “Danny Glover’s" hook, and less like the repetitive “Memo” or “Digits". Young Thug has quickly reached a point where every piece of music he releases is vital and necessary for examination. He’s not a rapper whose wordplay is varied -- things are described as often for what they are as for what they are not -- yet he’s as likely to brag about his good credit than he is about a common rap trope. Barter 6 reminds his definitive release for its unparalleled consistency in his catalog, along with how each song had at least one stellar line sure to be screamed at future concerts (“I want you to talk to the hand while I talk to bands” is just one hilarious example). His delivery is somehow still getting better, and Slime Season 3 succeeds as an exercise in discovering just how elastic syllables are. As Stereogum’s Tom Breihan titled a Status Ain’t Hood column, it’s Young Thug vs. language, and he’s continued to be undefeated.